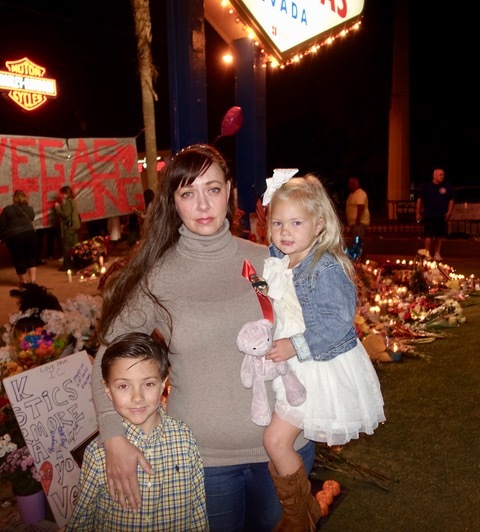 Heather Raasveld, a first responder, was home in her bed “with wet hair and in pajamas” when she got a call from a girlfriend late on that fateful Sunday night.“My friend said, ‘Promise me you won’t go,” recalled Raasveld, a 44-year-old mother of two youngsters. “I turned on the TV and told my husband, ‘I’ve got to go.’ He said O.K. but make sure you kiss you babies before you leave. “My six-year-old got up and knew something was wrong. “I drove as fast as I could to the station (Medic West) in North Las Vegas. “It was so odd. I live in Centennial Hills (in the northwest area of Las Vegas). It was so eerie driving to the station because nearly everybody on the road was going in the same direction. You could tell this was different. You could feel this was big. “We have probably 60 ambulances at our station and so many people reported (for duty) we ran out of them. “Highway Patrol had everything blocked off so there was a steady stream of lights and fire vehicles (on the way to the crime scene.) Reds and blues. We were dispatched to Russell Road and Las Vegas Boulevard. “At that time we thought the shooting was continuing. We had to stop and retreat. We didn’t know at the time it was over. “They pulled us out because there was a possibility that something could happen and wipe us all out. “When we were cleared we put a lot of super-injured people on buses and spent quite a bit of time at Desert Springs Hospital. It was so crowded, you couldn’t find a three foot-by-three square to put somebody down. “We went back and forth to the (crime) scene several times. We even went out to de Lima (St. Rose Dominican Hospital-Rose de Lima campus in Henderson at Boulder Highway and Lake Mead). “It was so crowded even janitorial service was trying to assist. Even the orderlies who moved the gurneys. Everybody was doing everything they could. “The hospitals were so worried about some sort of mass (terrorist) incident they had armed guards with automatic weapons. They were scoping everything out. “We finally left the venue about 4:45 a.m. Peoples belongings were scattered throughout. And the cell phones didn’t stop ringing. “When we got back to the station, there was quite a scene of camaraderie. They had started cooking for us, pushing food out but it didn’t seem like anyone wanted to eat. “We were debriefed and urged to talk to crisis management. We had to check each other to see if it was O.K. to get in our vehicles because of all the blood. We were walking in an inch of blood. You either washed your boots with high pressure spray or you went home in your socks. “If there is one thing I can stress is law enforcement and EMS (Emergency Medical Services), we are a family. You can’t separate us. We will support each other no matter what.